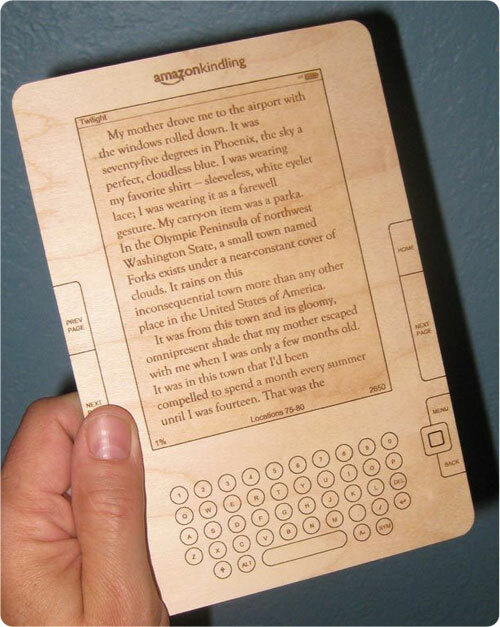 Couldn’t resist posting this picture of wooden Kindle. Folks at Incredible Stuff I Made with some help from Evil Mad Scientist Laboratories created it. Enjoy! Say Hello to the Kindling, the incredible palm-sized wireless reading device. Slim: Just 1/4th of an inch, thinner than most quesadillas. Lightweight: At 4 ounces, lighter than a typical Zippo. Uses no batteries or electricity; observe it for days without recharging. Complete lack of functional buttons. Also makes a handy cutting board.